My first close encounter with Amanda Wakeley was during the Spring Summer 2006 season when I was working backstage at London Fashion Week. This was my second season working as a Backstage Coordinator, where I was responsible for dressers and models. I loved the job as it was fast paced compared to shoots which would involve a lot of waiting around. Amanda Wakeley was my sixth show and my favourite collection because it oozed style and sophistication from every stitch. Off-white pencil skirts were teamed with cream leather jackets, and fluid soft wrap dresses were belted at the waist. At the end of the next year I was assisting a stylist dressing an actress for a film première. At the last minute there was a problem with the first choice dress, amid the panic I managed to organise a sample from Amanda's Spring Summer 2007 collection to arrive at the hotel we were based from and thankfully the floaty Grecian dress worked and the star of the cinema screen looked picture perfect! Sometimes situations are meant to be. 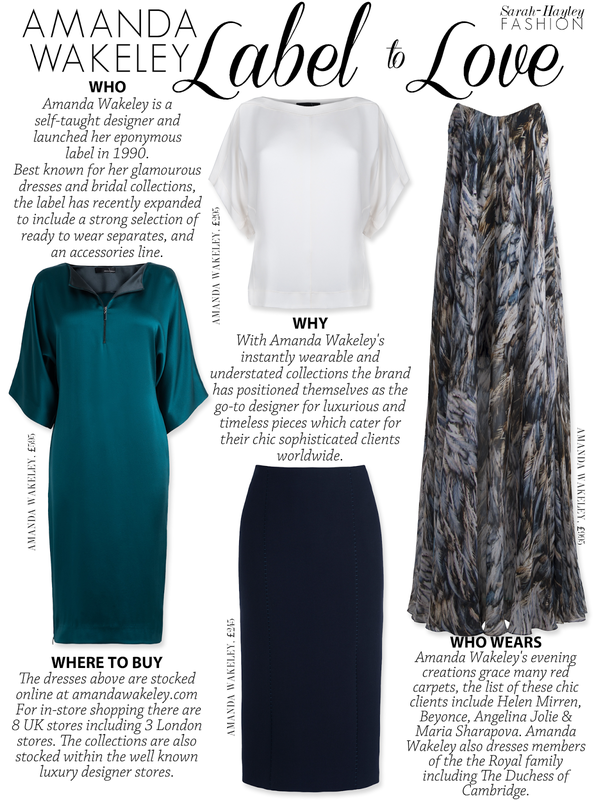 In January I attended the launch of the new Amanda Wakeley flagship at 18 Albemarle Street in London. The new store is set over two floors in a beautiful townhouse, with bespoke interiors designed by Amanda herself. Everyone who was anyone was there, including Elizabeth Hurley, Darcey Bussell, Alexandra Shulman, Caroline Rush and Harold Tillman to name a few. Guests sipped the 'Eightini' a special Belvedere cocktail to mark the occasion. For Autumn Winter 2014 Amanda hosted her comeback London Fashion Week show at the new store. The collection was very exciting using Japanese Warrior Women contrasted with Geisha women as the starting point. The all-black collection featured leather separates juxtaposed with woollen and sheer fabrics, strong silhouettes and cinched in waists. It was wardrobe heaven for the contemporary style concious career woman. Amanda Wakeley has the ability to create collections that are not only undeniably feminine and classic but also which feature an understated seduction.